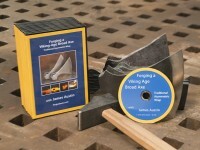 This professionally produced, 62 minute DVD covers in great detail the process of forging a broad axe by the asymmetric wrap technique which was the standard method of the Viking age. The forge work is carried out completely by hand with standard blacksmithing tools (plus a few special-purpose tools I developed) and the help of a striker. The quality of the video recording is excellent and it provides many amazing close-up views of the hot work which make the complex forging and welding process clear and easy to understand. 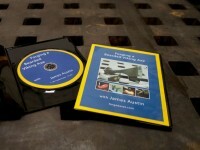 This DVD is a "must have" source of information for those people interested in the historical forging of Viking weapons and tools.